On Friday, May 11, noticing the disconnection between the outrageous outrage raging in the media and the lack of action in the streets, a media consultant called Shenzhen’s Old Cui 深圳老崔 made some enquiries with a friend in the police, which he then reported back to his 60,000-odd followers on Sina Weibo. I just talked with a PSB pal, and asked him why the government wouldn’t approve a demonstration by the people against the Philippines government. He said, you’re tapped in the head, as soon as you have anything resembling a demonstration the slogans will change to “down with corrupt officials”, and who’s going to clean that up — the sergeant? This weibo was reposted more than 11,000 times in the 13 hours before it was deleted. But although 11,000 reposts was impressive, Old Cui’s effort wasn’t quite as viral as another weibo that linked to footage of CCTV host He Jia’s now-famous slip-up a few days earlier, in which she stated twice that the Philippines was part of China’s historic territory. The latter was reposted more than 15,000 times in the same period of time, despite the fact that its originator had less than 1,000 followers. Word is, our country is organising a crack force to go and liberate Huangyan, an ever-victorious force of tigers and wolves. Advance party: Weibo Navy [commenters paid by PR companies]. Assault team: China’s city management forces [城管, famed for brutality and unreasonableness]. Canine division: one Kong, one Wu and one Sima [referring to rabid nationalists Kong Qingdong, Wu Fatian and Sima Nan]. Party branch: the Fifty-Cent Party. Bomb disposal: Chinese forceful eviction teams. Medic: none. Logistical supply team: none. Oh, and the flagship that will take this army there: Fang Zhouzi [方舟子 “Son-of-a-boat” Fang, known for quixotic attempts at debunking]. Zuoyeben has more than 2.9 million followers, and the post appears to have been in circulation for eight days before finally being deleted on May 18. Wang Wei 王巍, another weibo heavyweight with 1.4 million followers, has brazenly mocked non-combatant army officers with high military ranks, including Major-General Song Zuying 宋祖英 of the PLA’s song and dance troupe, and Major-General Li Shuangjiang 李双江, singer of red songs (and disgraced-by-association father of a violent young whippersnapper). Wang’s post was forwarded more than 9,000 times, but the censors have apparently decided to leave it in place, complete with the image at the top. 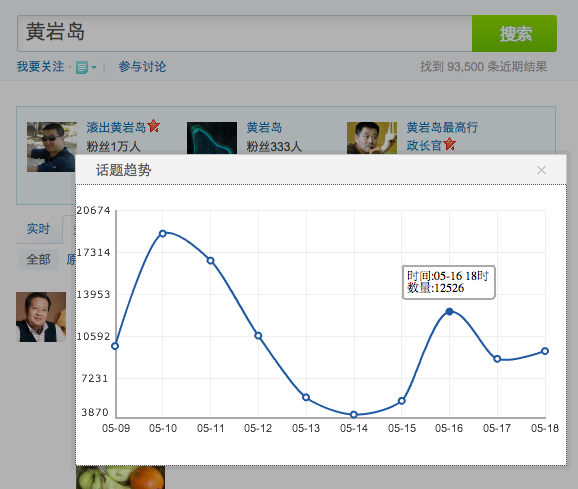 I’ve collected a few graphs from Sina Weibo on the topic of Scarborough Shoal. The first one, generated on May 18, illustrates the same pattern observed in relation to the five news portals that i generally concentrate on here (generally to the detriment of everything else) — a steep rise on May 9-10 as people started entertaining the possibility that China might actually take military action over Scarborough Shoal, a plateau over the weekend as inflammatory stories kept coming, followed by a gradual loss of interest when the crisis started showing signs of being alleviated. This suggests once again that the “wave” that came ashore in different areas of China’s media — from the centrally-controlled mouthpieces to semi-commercialised provincial media and commercially-oriented/state-compromised online news providers — successfully penetrated the much more user-directed discourse on Weibo. 3,283 what? 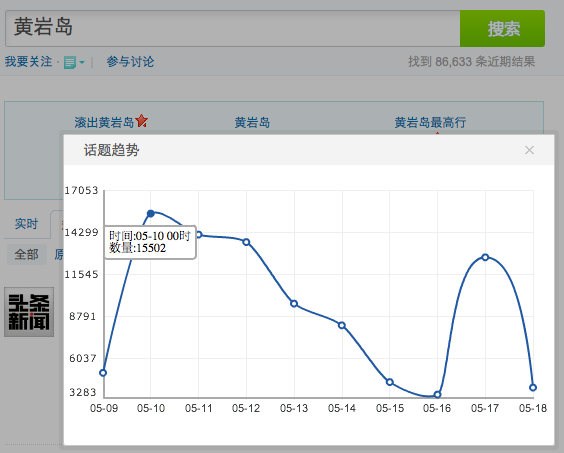 Are the figures on these graphs actually referring to the overall number of weibo sent? The number forwarded? The number of comments? The number of searches? Or is it some kind of composite index involving some or all of the above? If anyone happens to know the answer do please let me know in the comments. This time May 16 is shown as a spike and May 17 as a decline. The figures are completely different, the reason being that the points on the graph represent the figure (i’ll just refer to it as the “discussion factor”) for the 24 hours leading up to that point in time. The first graph was generated close to midnight, so it actually shows the trend in terms of calendar days. The second one was captured just before 7pm, so it shows 6pm-6pm cycles. 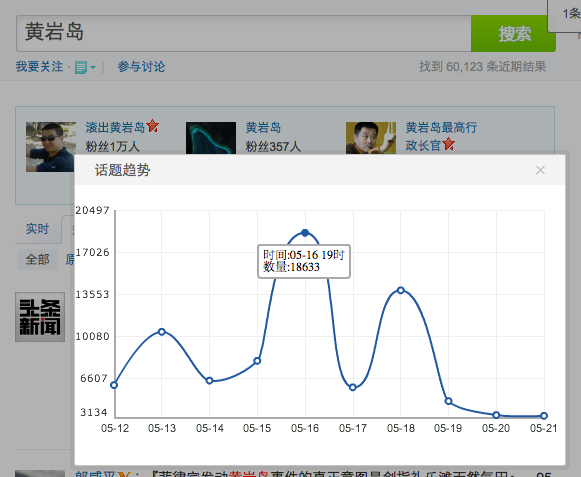 The first graph shows a “discussion factor” of about 3,000 for May 15, midnight to midnight, and the second shows the same figure as being above 12,500 between 18.00 on May 15 and 18.00 on May 16. So discussion on the topic of Scarborough Shoal was actually reignited on May 16, rather than May 17 as the first graph seems to suggest. This indicates the “discussion factor”, supposedly formed over 24 hours, rose from 12,500 or so at 6pm to more than 18,500 at 7pm. So did something happen between 6 and 7 o’clock on May 16? 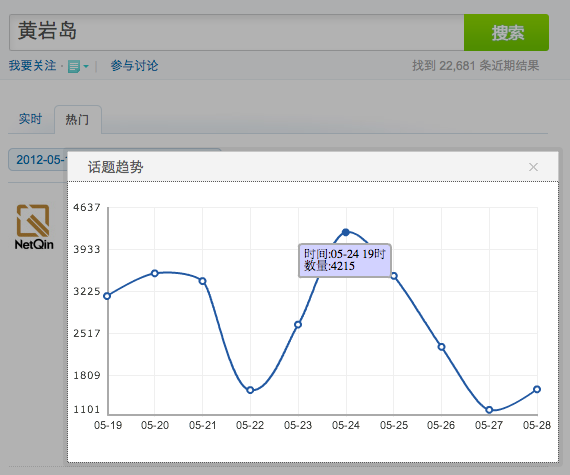 Well if it did, then Sina isn’t revealing what it was, because according to the “Advanced Search” function there were only 2,328 Huangyan-related results in total during that time, so my best guess would be that the graphs depict the numbers of keyword searches. Once again, please leave any suggestions in the comments. Although it looks pretty much the same as the others three graphs, there’s a huge difference in the scale of this one. If this line were on any of the other graphs it would be scudding along the bottom. The graph obscures the most important trend in the period it purports to illustrate: the decline in enthusiasm and interest in the issue, with the weibo public leading the way.